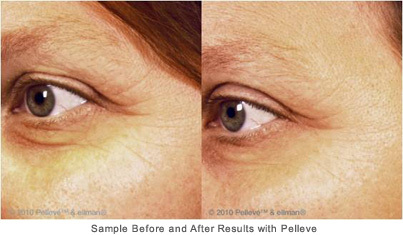 Pelleve is a new, non-invasive facial rejuvenation procedure. 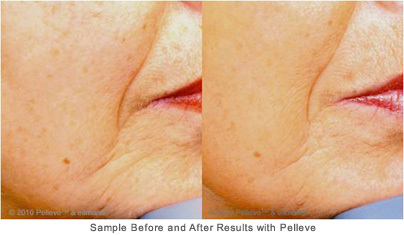 Similar to Thermage, Pelleve uses radiofrequency energy to firm and tighten skin, eliminating mild to moderate wrinkles. It received Food and Drug Administration approval in the U.S. in 2009, but has been used all over Europe for years. Your surgeon uses a hand-held device to heat your underlying facial tissues, causing the collagen in your skin to contract and stimulating the production of new collagen. (Collagen is the main structural protein found in skin, and its supply dwindles with advancing age.) The result is better skin quality and reduced laxity. There have been no head-to-head trials comparing Pelleve with Thermage, but Pelleve may hold certain advantages. For starters, there is no topical, local or general anesthesia needed, which means there is no pain and no downtime. No anesthesia is used with Pelleve because the doctor requires feedback from you during your treatment. Local anesthesia is used with Thermage. There may be some mild swelling and redness in the first 24 hours after your Pelleve procedure. The procedure itself takes 45 minutes to an hour; more than one treatment may be necessary. The sessions are usually spaced about one month apart. Pelleve can also be combined with other facial rejuvenation procedures such as injectables, including Botox or Juvederm. Pelleve should always be the first procedure because other procedures may require anesthesia. Pelleve treatment cost varies based on what part of your face is being treated. For example, Pelleve around your eyes costs $500, while a full face treatment may cost $1,500. Philip J. Miller, MD, is a facial plastic surgeon in private practice in New York City, and an assistant professor of otolaryngology at New York University School of Medicine. He graduated Phi Beta Kappa from Wesleyan University in Middletown, CT, with a Bachelor of Arts degree in biology. Dr. Miller received his medical degree from the University of Massachusetts School of Medicine in Boston, and completed an internship and residency in general surgery and otolaryngology/ head & neck surgery at New York University School of Medicine. Dr. Miller served as a fellow in facial plastic and reconstructive surgery at the Oregon Health & Science University in Portland, Ore. He is double board certified in facial plastic and reconstructive surgery and otolaryngology/head and neck surgery. Dr. Miller is a fellow of the American Academy of Facial Plastic and Reconstructive Surgery, a diplomate of the American Board of Facial Plastic and Reconstructive Surgery, a fellow of the American Academy of Otolaryngology – Head and Neck Surgery, a diplomate of the American Board of Otolaryngology, and a fellow of the American College of Surgeons.